Swamp Juice - The horn frog on the bottle looks like he lives in the very swamp water soda. Too cool! This greenish-brown tonic is the most complicated formulation with over a half-dozen flavor ingredients! It has a surprisingly delicious fruity taste. Dog Drool - The picture of old Rover on the bottle looks like his saliva glands are working overtime. This pinkish white orange-lemon soda will have you drooling too! Bug Barf - The picture of the bug on the bottle shows that he ate something that just didn't’t agree with him, but this greenish – yellow Kiwi/Pineapple mix is absolutely delicious. Monster Mucus - The monster on the bottle picture looks to be covered and dripping with mucus. This deep purple portion has lots of body and is bursting with flavor! It's berry berry tasty! Worm Ooze - The worm on the label looks like he just drank a bunch of his favorite soda to the point where he is just oozing with excitement! One happy little guy! Unicorn Yack - the new addition to the collection! Who doesn't love a Unicorn?? I know when I throw up it certainly does not resemble anything close to a rainbow....Anyway the Raspberry Orange Cream flavor is a winner! The fruity raspberry flavor comes across much stronger than the hint of orange and cream. Seriously very good!! Alien Snot - This little alien is just too cute! The kiddo who drew this came up with a winner. That's the cutest darn alien I think I've ever seen! And of course his smile indicates he is just overjoyed by the fact he just drank his favorite soda! Kitty Piddle - The look of the little kitty on the bottle says it all. I hear "oops" and like Steve Urkel used to say on Family Matters "Did I do that?" This pale yellow orange-pineapple soda is no accident! Toxic slime - This electric blue soda with white floaty bits looks like a science experiment gone wrong. 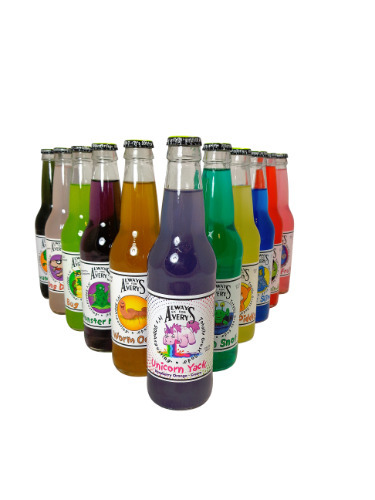 Blue raspberry, orange and lemon are the dominant flavors in this tasty soda. Zombie Brain Juice - This label on this Tangerine colored soda is just too funny! This little boy has his brain exposed with a drinking straw stuck into it. But don't let this scary boy fool you, this Strawberry Orange elixir will give your brain some go-go juice. Fungal Fruit - Don't let the fungus on the Passion Fruit scare you away, this pink Passion Fruit and Lime concoction will leave you wanting more!